Communication is the basis of a healthy shopper relationship, but lots of retailers that sell similar products communicate in very different ways. Are you getting your message right? Is it just a Barbie Dreamhouse, or a guarantee of a good night’s sleep? This is how different retailers present one popular toy this holiday season — some as a plaything, others as a solution to a need — and it reveals a potentially major opportunity (and necessity) all year-round when it comes to shopper messaging. What voice does your shopper hear, not only during the holidays, but every day? The ways in which communication connects with customers on an emotional level – making them feel smart, in control, cared for – is sometimes taken for granted, but such suppositions could be increasingly ruinous as you move beyond the holidays and into 2019 as shoppers become more and more channel, chain – and even brand – agnostic. A little digging revealed that retailers selling the same kinds of products often speak to shoppers in very different ways, both in-store and online. Some focus on function, while others on fashion; some live in the moment while others look to the future. In each case, they’re selling the same types of products, but presenting them to shoppers in sharply varying ways. Which is the right messaging for connecting on an emotional level? 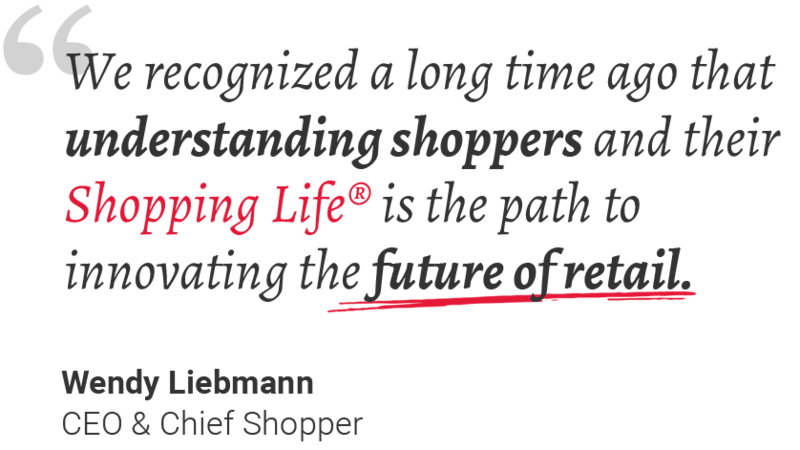 Our How America Shops® report, Benchmarking the Future, offers some guidelines on what shoppers want to know. Will you save me time? 76% of shoppers told us that saving time is a top motivator for their shopping choices. Will you make this trip easy? 46% of shoppers choose shopping destinations that simplify their lives; 44% prefer those that help reduce stress. So, are you speaking the right language to your customers? Here’s how a few very similar retailers are doing it to connect with shoppers – and differentiating themselves in the bargain. Walmart and Target’s toy stories. There may often be a happy ending when it comes to toy shopping, but these two toy sites have very different characters. Walmart’s toy site is a problem solver, topped with a rotation of lifestyle photos featuring children playing, followed immediately by “ways to shop”: colored icons representing age, brands, categories and even characters to shop. The shopper also can scroll down to browse top-sellers, sponsored items and the like, each complemented by a photo of a child at play. The site is clean and easy to navigate. Target’s toy approach is designed more to show what it offers. The landing page leads with a collage of toys, followed by a succession of categories (age, toy type, characters and brands) and suggested item for each. This layout accomplishes the same as Walmart’s site, but requires the shopper to navigate through grids of toy images and brand icons. This can be overwhelming and time consuming, but may appeal to shoppers in the mood to browse. Adidas and Nike on the sports experience. Two New York destination shops, each selling similar products, two completely different approaches and brand experiences. While the Adidas flagship concentrates on performance for you, the Nike store focuses on fashion and celebrity first. The Adidas shop is fitted with an indoor track so shoppers can try out shoes, as well as bleachers for taking a break. The merchandise is organized by how and when it is used, from time of day to weather conditions, all of which is essential to performance-minded athletes. At the Nike store, mannequins don athletic wear designed both for performance and street chic. Pulsing music and celebrity images transform the quest for fitness into fun and glamour, accessible to all. Nike’s store also includes a running track, like the Adidas shop, but the environment and messaging make for a more stylish experience, which could appeal to social shoppers, such as those on group outings. CVS Health and Walgreens. Here’s how retailers that are very undifferentiated work hard to be heard —one for health and the other, beauty. CVS has been transforming itself from a drug store chain into a complete wellness brand, not only with its recent acquisition of Aetna, but also in many other aspects of its stores. Most recently it added a virtual physician service as well as prescription delivery and a membership services for fast delivery of prescriptions and other products, as well as discounts. In the store it replaced tobacco products with “better for you” items and introduced “Discovery Zones” that highlight wellness needs. While CVS is also testing new beauty formats, Beauty IRL, in select stores the big message in every store is health. Walgreens, meanwhile, recently partnered with sample box company Birchbox to become a place to test and play with beauty for a younger generation of shoppers. It is transforming up to 1,000 square feet of select stores into mini Birchbox boutiques, with full lines of hair, skin and makeup brands as well as stations where shoppers can stop and try product. Both are drug stores, but their messages to shoppers target different needs. Hy-Vee and Kroger: Similarly, the grocery chain Hy-Vee, through its partnerships with Orangetheory Fitness, is establishing itself as a food seller that wants to talk about health and wellness. Shoppers can get a workout before or after shopping, and visit the dietician for suggested meal items. It has also opened a new banner called HealthMarket, which says it all. Major chains such as Kroger also offer healthy-food sections, but are talking more loudly about convenience, such as through its Click-and-Collect, to appeal to shoppers who are on a strict time budget. What these retailers make clear is that increasingly, products alone don’t sell themselves -- especially when those products (and brands) are often available in many different places. Smart retailers (and their manufacturer partners) recognize they must be a brand unto themselves, with a unique voice. So they are talking to their target shoppers in the languages they deem emotionally essential at the moment of anticipation and interaction – whether it’s simplicity, fun, style or price. The “brand on the door” is now as important as the “brand on the floor” and the voice and emotional promise they deliver is more and more essential today – and especially tomorrow.